Beautiful tone musically expressed is our goal. 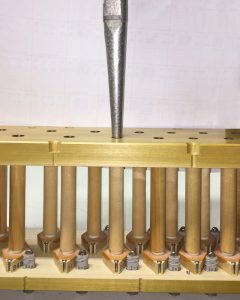 An organ pipe can produce a sublime sound, but it cannot be fully realized musically unless it is under the precise, minute and flexible control of the organist. What has held the organ back in expressiveness as compared with most other musical media is its mechanism. 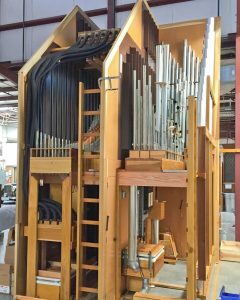 We have invested heavily to improve each part of the organ mechanism so that the organist can bring out every aspect of tonal color with ease. All of these mechanical features working together are what we call—The Schoenstein System. 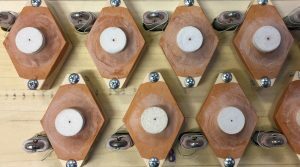 Building an organ in the Schoenstein System is expensive, but the results gained in musical versatility make its application a practical value. The Schoenstein System has many parts which are discussed in the articles referenced in that section of our web site, but two key elements are highlighted in the two adjacent tabs: Expansion Cell and Double Expression. Speed and precision of both key and stop action are critical to the success of an organ. 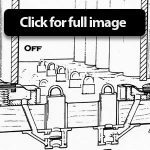 Key action must be lightning fast on both attack and release and respond uniformly from all keys regardless of the number of stops or couplers employed. Stop action must be fast and clean, i.e., without any hesitation or gulping on draw or release. The system must be silent. To meet these requirements we use electric-pneumatic action with an individual-valve windchest. 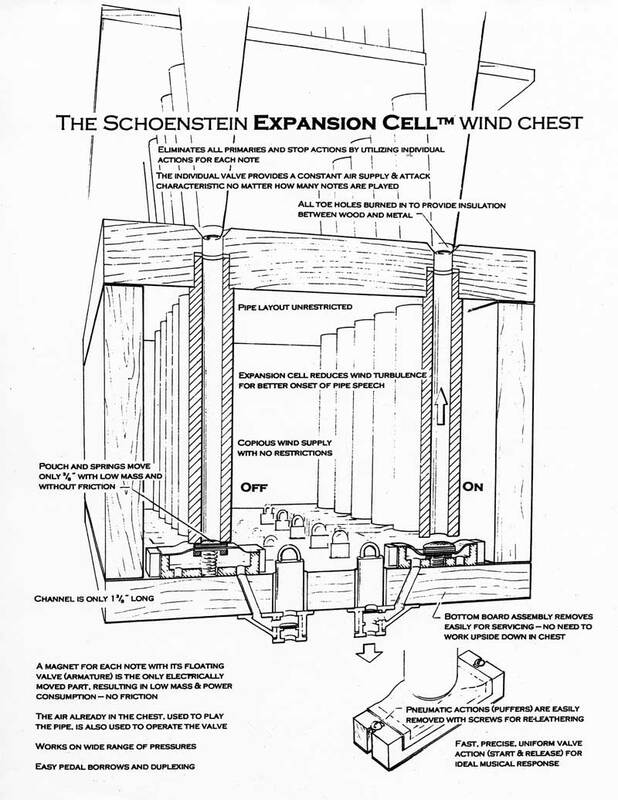 The expansion cell provides a cushioning effect similar to that of a note channel in a slider chest. It also allows placement of all action components near one another on the bottom board to reduce action channeling and increase speed. The most important musical advantage of individual valves is the elimination of interdependence of pipes. With the exception of mixtures, where all pipes of a given note always speak together, we consider it a serious musical defect to place pipes on a common channel where the wind characteristics are different depending on the number of stops drawn and where there is a possibility of negative interaction within the channel. 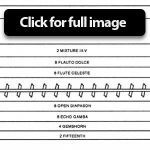 Each pipe should produce the same sound each time it is played, no matter how many others are combined with it. The most important reason for absolute uniformity of chest response under all conditions is the fact that pipes do not have the flexibility to adjust for variations in attack, wind supply, and release as do other wind instruments. By maintaining absolute uniformity, the performer knows what will happen every time a pipe is played. The best way for an artist to achieve lyrical phrasing, clear articulation, and accent is through absolute control of timing, therefore, it is important to enhance speed and accuracy of response. A good expression box when fully open should not rob the pipes of clear projection and presence to any great degree, but when closed should reduce loudness from at least ff to p. To achieve this, a box must be reasonably sound-proof (with adequate density to control leakage of bass) and must be well sealed when closed; gaps are anathema to good expression-box control. The shades cannot be too thick; their bulk will not permit a full use of the opening. Shades should be able to open nearly 90°. They must be fast-acting and silent. Achieving smooth, continuous expression control is one of the greatest challenges in organ-building. To achieve a continuous dynamic range from fff to ppp we have developed a system of double expression, placing a box within a box. The inner box is placed at the rear of the outer main box so that there is a large air space between the two sets of shades. When both sets of shades are closed, the space contained between them provides a very effective sound-trap. We place the softest and most powerful sounds inside the inner box of the division: for example, a pair of ethereal strings and the Vox Humana; the high-pressure chorus reeds and a mixture. A balanced expression pedal is provided at the console for each box. On large instruments a switching system allows the organist to select conveniently which shades are to be assigned to each balanced pedal. With the shades not quite fully open, the stops under the inner box are at a normal volume level to balance the rest of the division. With both sets of shades fully closed, the soft stops in the inner box are reduced to near-inaudibility and the chorus reeds are reduced to the level of color reeds. With all shades fully open, the chorus reeds and mixture are slightly louder than those of the Great. The Vox Humana usually has its own shades with a console switch to shift from pp to mf. There are many expressive possibilities with this system. 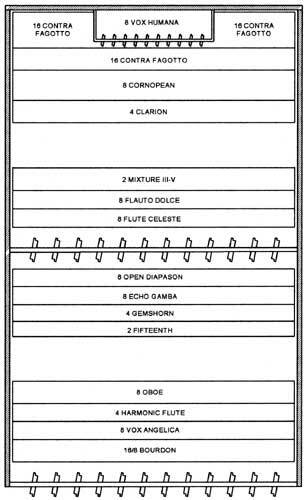 For example, a crescendo may be started using the ethereal strings with both boxes closed, opening the inner box until the level is equal to the soft stops in the outer box, which are then added. The outer box is opened, adding stops in the normal manner while closing the inner box. The chorus reeds and mixture are drawn and the inner box re-opened to complete the crescendo. This is done with ease after a bit of practice. Organs with double expression can be played in the traditional manner simply by disengaging the double expression feature.